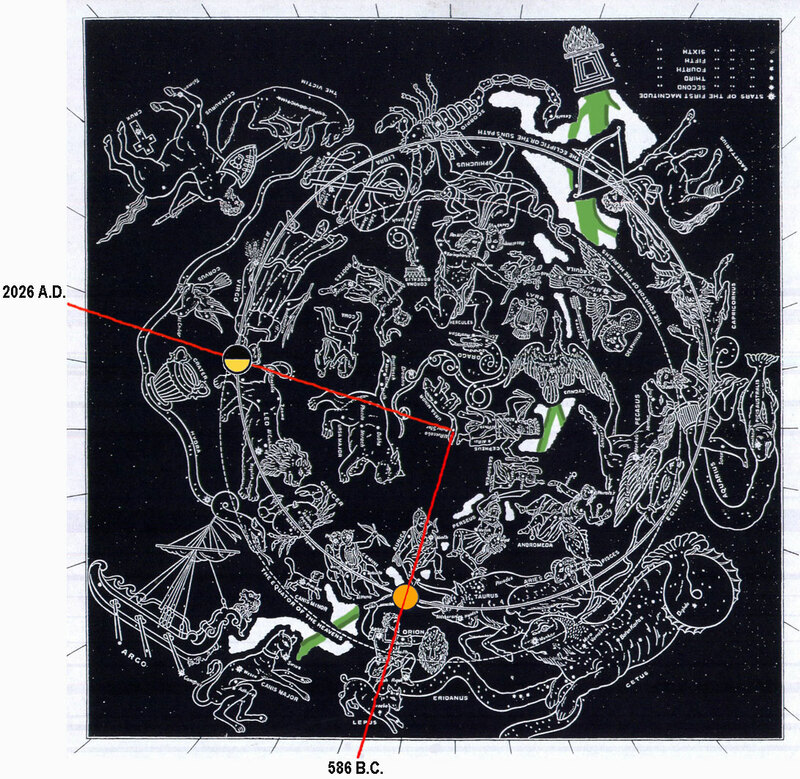 Obadiah Star Chart: Clockwise from when "Thou shouldest not have entered into the (solar golden) gate of my (Gemini) people in the day of their calamity" (v. 13) in 586 B.C. till "thou exalt thyself as the (Corvus) eagle, and ... thou set thy (lunar half moon) nest among the stars", but "I will bring thee down" (v.4) in 2026 A.D. is 2611° years which is seven complete laps (red radius "7") plus 91° years more. "For thy (Orion) violence against thy (Auriga) brother Jacob (in 586 B.C. )(red radius) shame shall cover thee, and thou shalt be (red radius) cut off for ever" (v. 10). "As thou hast done, it shall be done unto thee: thy reward shall return upon thine own (Virgo) head" (v. 15) in 2026 A.D. after 2611° years which is seven times around (a red "seven") plus 91° years more. 1 The vision of Obadiah. Thus saith the Lord God concerning Edom; We (Orion and Auriga) have heard a rumour from the Lord, and an ambassador is sent among the heathen, Arise ye, and let us rise up against her (Virgo) in battle..
3 The pride of thine heart hath deceived thee, thou (Corvus) that dwellest in the (red radius line) clefts of the rock, whose habitation is high; that saith in his heart, Who shall bring me down to the ground? 4 Though thou exalt thyself as the (Corvus) eagle, and though thou set thy (lunar half moon) nest among the stars, thence will I bring thee down, saith the Lord. 5 If (Orion and Auriga) thieves came to thee, if (Orion and Auriga) robbers by night, (how art thou cut off!) would they not have stolen till they had enough? if the grapegatherers came to thee, would they not leave some (solar or lunar) grapes? 7 All the (Orion and Auriga) men of thy confederacy have brought thee even to the (red radius line) border: the men that were at peace with thee have deceived thee, and prevailed against thee; they that eat thy (solar) bread have laid a (red radius) wound under thee: there is none understanding in him. 8 Shall I not in that day, saith the Lord, even destroy the (Orion and Auriga) wise men out of Edom, and understanding out of the (red radius line) mount of Esau? 9 And thy (Orion and Auriga) mighty men, O Teman, shall be dismayed, to the end that every one of the mount of Esau may be (red radius line) cut off by slaughter. 10 For thy (Orion) violence against thy (Auriga) brother Jacob (red radius) shame shall cover thee, and thou shalt be (red radius) cut off for ever. 11 In the day that thou (Orion) stoodest on the other side, in the day that the (Orion and Auriga) strangers carried away captive his forces, and foreigners entered into his (solar golden) gates, and cast lots upon Jerusalem, even thou (Orion) wast as one of them. 12 But thou shouldest not have (red radius line) looked on the day of thy (Auriga) brother in the day that he became a stranger; neither shouldest thou (Orion) have rejoiced over the (Gemini) children of Judah in the day of their destruction (586 B.C. ); neither shouldest thou have (red radius) spoken proudly in the day of distress. 14 Neither shouldest thou (Orion) have stood in the crossway, to cut off those of his that did escape; neither shouldest thou have delivered up those of his that did remain (Gemini) in the day of distress. 15 For the day of the Lord is near upon all the (Orion abnd Auriga) heathen: as thou hast done, it shall be done unto thee: thy reward shall return upon thine own (Virgo) head. 16 For as ye have (red radius blood) drunk upon my (red radius) holy mountain, so shall all the (Orion and Auriga) heathen drink continually, yea, they shall drink, and they shall swallow down, and they shall be as though they had not been. 17 But upon mount Zion shall be deliverance, and there shall be holiness; and the house of Jacob shall possess their possessions (2026 A.D.). 18 And the house of Jacob shall be a (solar) fire, and the house of Joseph a (solar) flame, and the house of Esau (Virgo) for (lunar black) stubble, and they shall kindle in them, and devour them; and there shall not be any remaining of the house of Esau; for the Lord hath spoken it. 19 And they of the south shall possess the (red radius) mount of Esau; and they of the plain the Philistines: and they shall possess the fields of Ephraim, and the fields of Samaria: and Benjamin shall possess Gilead. 20 And the captivity of this host of the (Gemini) children of Israel shall possess that of the Canaanites, even unto Zarephath; and the captivity of Jerusalem, which is in Sepharad, shall possess the cities of the south. 21 And (Orion and Auriga) saviours shall come up on (red radius) mount Zion to judge the (red radius) mount of Esau (in 2026 A.D.); and the kingdom shall be the Lord's (in 2026 A.D.).